Herrrre's Parrot, or Crooked Man, or indeed, Bitter End; as the multi-faced producer struggles with his identity we benefit through a slew of top drawer house music from the Sheffield native. 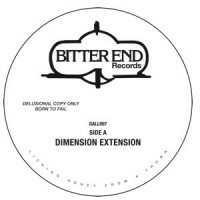 "Dimension Extension" on side A, cooks up a sumptuously throbbing, cockle-warming disco stew from the meagre ingredients of a sprouted wah wah guitar potato, brass carrots and a bouquet garni of dizzying strings. Yum yum! On the flip "Be There Again" takes as inspiration a swirling funk-soul nugget from '77, augmented with some 21st century sonic sorcery and most welcome synth noodle in the 3rd act. It's another winning double header from man who gave us Piccadilly's 12" of the year last year. Matt says: Bitter End lets off another unsanctioned dual shot of UK house music that you won't find anywhere else.